Cobalt metal films have increasing importance as magnetic materials, precursors to CoSi2 contacts, liners and encapsulation of copper vias an lines in interconetc, and possibly even as copper replacement conductors know as Cobalt fill. Here Wayne State, UT Dallas and former SAFC HiTech now EMD Performance Materials of MERCK publish an important paper on selective Co ALD at low temperature using bis(1,4-di-tert-butyl-1,3-diazadienyl)cobalt and formic. Here are more details on the Picosun and Hitachi MECRALD Process in a recent article in Solid State Technology: A new microwave electron cyclotron resonance (MECR) atomic layer deposition (ALD) process technology has been co-developed by Hitachi High-Technologies Corporation and Picosun Oy to provide commercial semiconductor IC fabs with the ability to form dielectric films at lower temperatures. Silicon oxide and silicon nitride, aluminum oxide and aluminum nitride films have been deposited in the temperature range of 150-200 degrees C in the new 300-mm single-wafer plasma-enhanced ALD (PEALD) processing chamber. Here is a new exciting technology from French start-up EnHelios NanoTech called Atomic Layer Printing. They are first targeting silicon solar cell rear-passivation layers, with caping and contact opening in on single wafer pass. The technology was presented at French annual ALD conference RAFALD in December last year. Rear-passivated solar cells (PERC) is a widely adopted improvement for solar cells based on p-type solar wafers. However this improvement is expensive to implement as it requires two to three additional equipments for passivation layer deposition ; capping layer deposition and contact opening. Atomic Layer Printers are modular equipments processing one wafer per printing head. R&D equipments have one printing head while production equipments combine multiple printing heads. Today Beneq released productivity data for their new 200 mm ALD Batch tool T2S. Beneq T2S™ is the newest member in Beneq’s wafer-based production equipment portfolio. It offers a unique combination of high capacity batch processing and standard cassette-to-cassette automation. The Beneq T2S is specifically engineered to match the semiconductor requirements, including the SEMI S2 safety requirements and low particle counts. Join the Critical Materials Council (CMC) Conference 2017, May 11-12 in Richardson, Texas. Join the Critical Materials Council (CMC) Conference 2017, May 11-12 in Richardson, Texas. 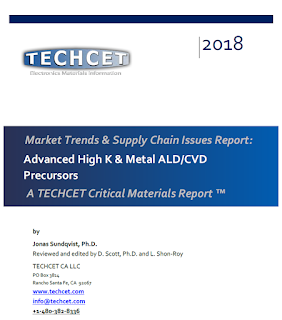 Get actionable information on materials and supply-chains for current and future semiconductor manufacturing. Keynote by Dr. Hans Stork, SVP & CTO of ON Semiconductor, as well as presentations from IDMs, OEMs, materials suppliers, and analysts. Save this link to check-in on the latest program updates. Harvard reports: Researchers from the Harvard John A. Paulson School of Engineering and Applied Sciences (SEAS) have developed a new flow battery that stores energy in organic molecules dissolved in neutral pH water. This new chemistry allows for a non-toxic, non-corrosive battery with an exceptionally long lifetime and offers the potential to significantly decrease the costs of production. Impact of atomic layer deposition to nanophotonic structures and devices. 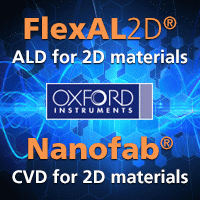 What's the impact of atomic layer deposition to #nanophotonic structures and devices? EUREKALERT! reports: ULSAN, South Korea--A new study, affiliated with UNIST has introduced a novel method for fabrication of world's thinnest oxide semiconductor that is just one atom thick. This may open up new possibilities for thin, transparent, and flexible electronic devices, such as ultra-small sensors. Message from the co-chairs of ALE2017: The 4th International Atomic Layer Etching Workshop (ALE2017) will be in Denver, Colorado on July 15-17, 2017. ALE2017 will be held in conjunction with ALD2017. The abstract submission deadline for ALE2017 is February 17, 2017. Details are posted on the conference website at: https://aldconference.avs.org/. Please submit your abstracts to ALE2017 on the focus topics including: plasma and/or energy-enhanced ALE; gas-phase and/or thermal ALE; solution-based including wet ALE; selective ALE; ALE hardware, diagnostics, & instrumentation; modeling of ALE; atomic layer cleaning (ALC); integration of ALD + ALE; and applications for ALE. We will have an exciting ALE2017 workshop. We have 12 invited speakers that are given below. We look forward to your contributed abstracts and seeing you in Denver at ALE2017. I think that many as me have followed the innovative ALD developments from CU Bolder and Prof. S. M. George´s group through the years with excitement. Many discoveries have over time led to actual deployment in industrial high volume manufacturing using the processes, precursors and technologies form his group. I would like to especially mention the work on Tungsten ALD and catalytic SiO2 ALD that were very hot in the DRAM industry when ALD was introduced in production 2004 and onward. Catalytic SiO2 ALD was actually one of the early candidates as a conformal liner for the first versions of double pattering. Now S.M. George is leading the development in new groundbreaking work on Atomic Layer Etching (ALE) and I am sure that some of those discoveries are heading to high volume manufacturing of leading edge Logic and Memory devices as well. It will be very exciting to learn the latest in this field when ALE 2017 comes to Denver Colorado this summer, co-chaired by S.M. George and Keren Kanarik from Lam Research. Early 2000 a new company was spun out from CU Boulder and here is the story about ALD NanoSolutions. ALD NanoSolutions was spun out in 2001 from premier atomic layer deposition (ALD) laboratories at the University of Colorado to industrialize ALD applications "In 1997, Professor Alan Weimer of chemical and biological engineering heard a campus talk by Professor Steven George of chemistry about a novel process of coating surfaces with the thinnest of materials possible, known as atomic layer deposition (ALD)." 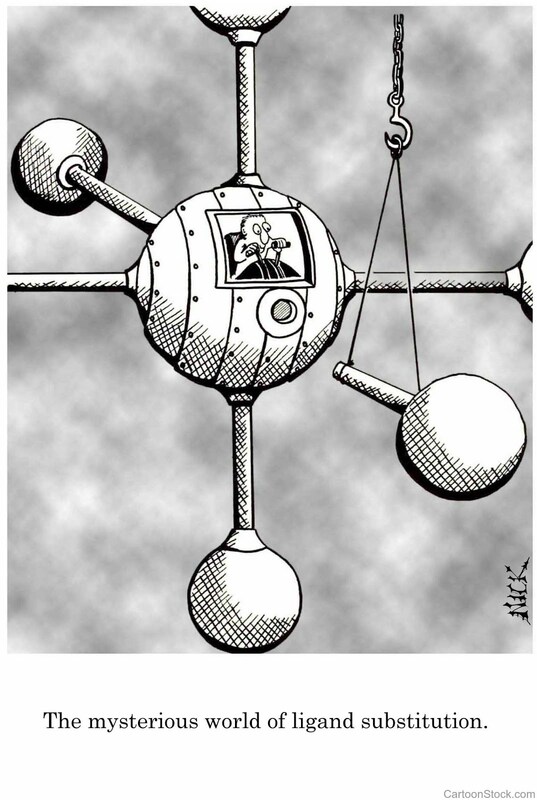 Within a few years Weimer and George had filed a number of patents on the technology, gaining exclusive rights to a wide range of intellectual property. 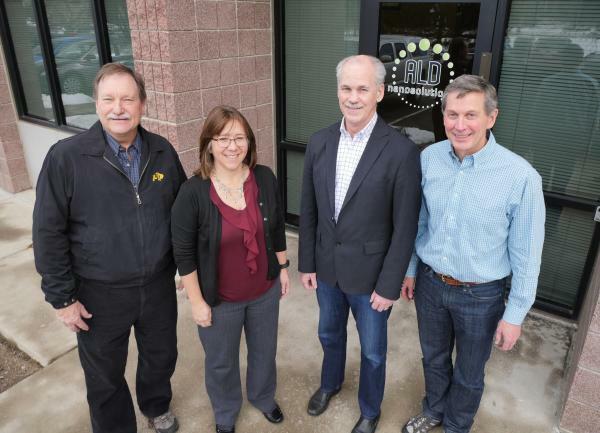 When the CU Technology Transfer Office strongly hinted it would be a good move to start a spin-off company, Weimer and George sought out CU Boulder postdoctoral researcher Karen Buechler, who was working in Weimer’s lab at the time. A picture from the ALD NanoSolutions ALD factory floor and laboratories in Broomfield, Colorado. (photo provided by ALD NanoSolutions). Some of you may recognize Daniel Higgs Product Development Manager at ALD NanoSolutions in the background. 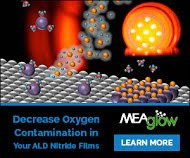 Since the the company has grown and is today well known in the ALD industry for their ALD on particle technologies and patent portfolio (LINK) as well as ALD on flexible polymer. Here is the story about how ALD NanoSolutions at CU Boulder, USA was formed as a spinoff 2001. After talking to Joe Spencer (Director of Operations) some time ago he informed me that they have pilot units in the field and current version can handle 200 kg/day and this year they will scale up to 1000 kg/day - ALD NanoSolutions Particle ALD has broken the barriers for high volume manufacturing! 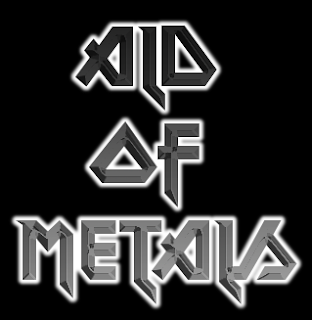 In between all those very important policy tweets for the world as we knew it there seems to be Metal ALD theme this week on Twitter. Many new interesting publications on both the practical and theoretical paths to successful ALD of Metals to solve those BEOL issues at 7 nm. Copper ALD Molecular Dynamic simulation by SCIENOMICS. The joint tutorials for AVS 17th International Conference on Atomic Layer Deposition (ALD 2017) featuring the 4th International Atomic Layer Etching Workshop (ALE 2017) has been released with a great line up. As in past years, the tutorials will be taking place the day before the actual conference (Saturday, July 15). The AVS 17th International Conference on Atomic Layer Deposition (ALD 2017) featuring the 4th International Atomic Layer Etching Workshop (ALE 2017) (Download PDF Flyer) will be a three-day meeting dedicated to the science and technology of atomic layer controlled deposition of thin films and now topics related to atomic layer etching. Since 2001, the ALD conference has been held alternately in the United States, Europe and Asia, allowing fruitful exchange of ideas, know-how and practices between scientists. This year, the ALD conference will again incorporate the Atomic Layer Etching 2017 Workshop (ALE 2017), so that attendees can interact freely. The conference will take place Saturday, July 15-Tuesday, July 18, 2017, at the Sheraton Downtown Denver in Denver, Colorado, USA. San Diego, Calif., Feb. 1, 2017 - Transparent window coatings that keep buildings and cars cool on sunny days. Devices that could more than triple solar cell efficiencies. Thin, lightweight shields that block thermal detection. These are potential applications for a thin, flexible, light-absorbing material developed by engineers at the University of California San Diego. Using 3D patterning and ALD UCSD researchers has developed a new flexible, light-absorbing material that can be used as a transparent, heat-blocking window coatings or infrared detection shields. 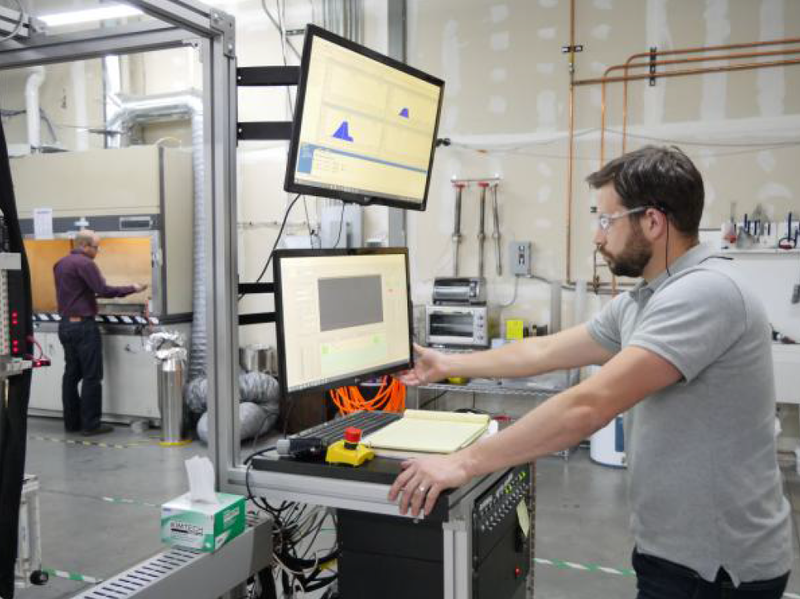 The materials were fabricated using advanced nanofabrication technologies in the Nano3 cleanroom facility at the Qualcomm Institute at UC San Diego. This facility has a Beneq TSF200 ALD reacor (LINK) possibly used for the ALD processing. Full paper: “Near-perfect broadband absorption from hyperbolic metamaterial nanoparticles.” Authors of the study are Conor T. Riley, Joseph S. T. Smalley, Jeffrey R. J. Brodie, Yeshaiahu Fainman, Donald J. Sirbuly and Zhaowei Liu. Veeco Instruments Inc. (NASDAQ: VECO), a global leader of advanced thin film etch and deposition process equipment, and Ultratech, Inc. (NASDAQ: UTEK), a leading supplier of lithography, laser-processing and inspection systems used to manufacture semiconductor devices and LEDs, today announced that they have signed a definitive agreement for Veeco Instruments Inc. ("Veeco") to acquire Ultratech, Inc. ("Ultratech"). The Boards of Directors of both Veeco and Ultratech have unanimously approved the transaction. Ultratech shareholders will receive (i) $21.75 per share in cash and (ii) 0.2675 of a share of Veeco common stock for each Ultratech common share outstanding. Based on Veeco's closing stock price on February 1, 2017, the transaction consideration is valued at approximately $28.64 per Ultratech share. The implied total transaction value is approximately $815 million and the implied enterprise value is approximately $550 million, net of Ultratech's net cash balance as of December 31, 2016. Post transaction it is projected that Ultratech shareholders will own approximately 15 percent of the combined company. Ultratech is a recognized leader of lithography products for Advanced Packaging applications and for LEDs and is a pioneer for laser spike anneal technology used for the production of semiconductor devices. In addition, the company offers wafer inspection solutions leveraging its proprietary coherent gradient sensing (CGS) technology which address a wide variety of semiconductor applications. "The strategic combination will establish Veeco as a leading equipment supplier in the high growth Advanced Packaging industry. Ultratech's leadership in lithography together with Veeco's Precision Surface Processing (PSP) solutions form a strong technology portfolio to address the most critical Advanced Packaging applications. We believe our complementary end market exposure and customer relationships will create the ideal platform to accelerate growth," said John R. Peeler, Veeco's Chairman and Chief Executive Officer. "Ultratech is a great fit with our strategy to profitably grow our business and diversify our revenue. 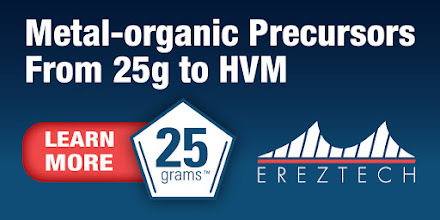 We expect this transaction to be immediately accretive to adjusted EBITDA and non-GAAP EPS." Ultratech Chairman and Chief Executive Officer, Arthur W. Zafiropoulo said, "Both companies have a strong heritage of developing innovative and cutting-edge technologies. The combined company will create a formidable team to execute against growth opportunities and deliver significant value to customers and shareholders." Veeco expects to realize approximately $15 million in annualized run rate synergies within 24 months after closing, to be achieved through increased efficiencies and leveraging the scale of the combined businesses. The combined company is expected to have an efficient balance sheet, benefiting from the deployment of excess cash. The transaction is expected to close in the second calendar quarter of 2017, subject to approval by Ultratech shareholders, regulatory approvals in the U.S. and other customary closing conditions. NovaldMedical ltd Oy demonstrates how its patented thin film coating solution improves the flow behavior of paracetamol powder compared to non- treated paracetamol. NASA Reports: Japan’s ancient art of paper folding has inspired the design of a potentially trailblazing “smart” radiator that a NASA technologist is now developing to remove or retain heat on small satellites. Vivek Dwivedi, a technologist at NASA’s Goddard Space Flight Center in Greenbelt, Maryland, has teamed with a couple of researchers at Brigham Young University in Utah to advance an unconventional radiator that would fold and unfold, much like the V-groove paper structures created with origami, the art of transforming a flat piece of paper into a finished sculpture.